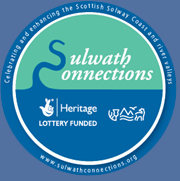 Heritage Lottery Fund, Sulwath Connections Landscape Partnership, Historic Scotland, Landfill Tax Credit, Common Good Fund, Forestry Commission Scotland, George Hunter Trust, Clydesday Bank; Magnox North, Galloway Association of Glasgow, Lochmaben Common Good, National Trust for Scotland and all who helped in any way. Journey back 700 years to the Wars of Independence and see Dumfries and Galloway through the eyes of Scotland's greatest King. 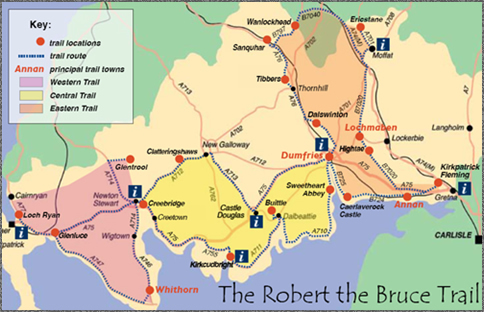 THE summer of 2009 was a key point in the development of the Bruce Trust's objective, raising the profile of Scotland's King Robert the Bruce. It marked the completion of three year's painstaking work drawing together all the places in south west Scotland's Dumfries and Galloway region which have strong connections with Bruce whose family home for centuries was in Annandale, first at Annan and later at Lochmaben. The result.four fascinating trails centring on Dumfries where the murder of the Red Comyn launched the Wars of Independence which eventually secured freedom and independence for Scotland. The importance of the trails, in terms of education and tourism, was emphasised with Royal assent when the Duke of York, Prince Andrew, officially declared them open. Please fill in your name and email to download The Trail Leaflet.